The Quickest Access to Professional Hydrostatic ! 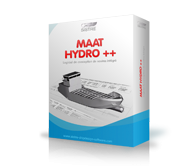 MAAT Hydro is a solid based hydrostatic solver appreciated by most classification societies, combining real time analysis and highest level calculation utilities. 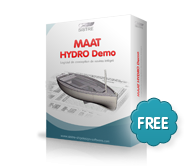 Thanks to its newest technology and its highly visual user interface, MAAT Hydro makes hydrostatic calculations more accurate and intuitive than ever and allows marinizing your favourite 3D modeller in a few clicks ! Highly operational demo version providing a free access to real time hydrostatic simulation, basic hydrostatic analysis and intact stability. Immediately provides all the hydrostatic yacht design tools (real time simulation, heeled lines, hydro - stability, lines plan...) to your favourite 3D modeler. immediately provides all the hydrostatic tools needed by professional ship and boat designers to your favorite 3D modeler. 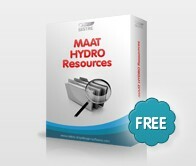 Latest manuals, video tuturials / demo, standard stability criteria and sample files can be instantly downloaded on MAAT Hydro's Resources Page. MAAT Hydro Rev. 8.0 can now be downloaded on its installation page ! MAAT Hydro Rev. 8.0 introduces new calculation tools in menu's 'Tools' tab (V-Lines, Tonnage, List Lines, List Loadings,- List Damages, ...) and a new 'Full + Max FSM' tank filling option allowing to combine directly tank's full load with a maximum FSM correction. Moreover, the automated stability caculation provided by the [Retain Comb. Cases] button now generates a synthetic compliance table allowing to identify the problemeatic load / damage combinations immediately. At last, the charateristics of the masses currently selected in the 3D browser are now also displayed in the 3D viewports. 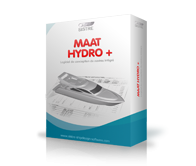 Simultaneously, after having implemented a new line modeler, the integration of MAAT Hydro's new generation hull modeller is underway and the first tests might start in 2017. MAAT Hydro Rev. 7.12 can now be downloaded on its installation page ! MAAT Hydro's Rev. 7.12 introduces a new NURBS++ line modeling tool, preceding its new generation hull surface modeler, currently under development. In addition to its ergonomics and ease of use, this new module provides most of the MAAT 2000 line modeling functions, also introducing new features. The associated hull surface modeler will be gradually released, in order to provide a full hydrostatic control at all the hull design steps. At last, many layout details have also been improved in order to make the software even easier to use !